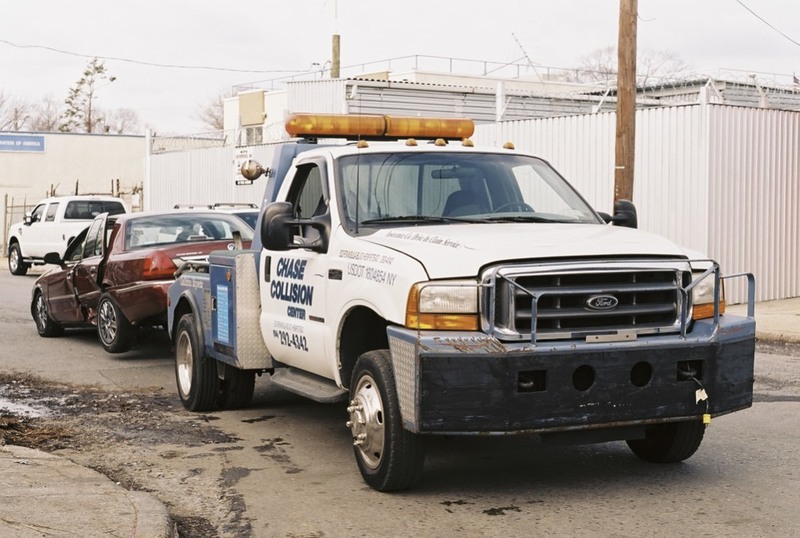 We at Chase have our own fleet of fully licensed and insured tow trucks ready to transport your vehicle. We are available 24 hours a day, -Discount towing available. FREE towing to those who qualify* -contact the office for more information. In addition to private towing we also work with the local police departments and municipalities to tow vehicles that have been in accidents and carry out parking enforcement. If you drive a car, you may one day need to have your car towed or, worse, discover your car has been towed. When hiring, look for licensed tow companies. Before you allow a private tow truck to hook your car, check the driver's side of the vehicle for the company's name, address, phone number, and license medallion. The medallion is a metal plate. If this information is not displayed, the truck is either unlicensed or in violation of licensing rules and should be reported. Keep a record of the tow truck's medallion number. In addition, every tow truck driver must carry his or her tow truck driver's license at all times. Carefully check the forms you may have to sign. Sign only an Authorization to Tow form or towing bill receipt issued by the licensed towing firm. You are not required to sign an Authorization to Repair form in order to get your car towed. Always read forms carefully before you sign them. If you sign a "Designated Representative" form, you are designating the towing company to represent your interests with your insurance company. You are never required to sign a "Designated Representative" form. For any work you want done, get the details in writing. Never sign a blank form. Be sure the tow truck driver gives you a copy of the Consumer Bill of Rights Regarding Towing, as required by law. Choose your own repair shop. You have the right to have your car repaired by whomever you choose. If you don't want the towing firm to fix your car, clearly tell the truck driver not to repair it. Don't sign the towing firm's "Authorization to Repair" form. Check your car carefully before it is towed. Note any damage to your car before it is towed. Take out all valuables, including those in the trunk and glove compartment. Get a clearly itemized bill. You will need it if you want to challenge any charges. Also, your insurance company may require it. If you are in an accident or break down on the highway, you must use a licensed towing firm called by the police. You may not call your own tow truck. The truck summoned by the police is the only one that may respond, however the towing firm, by law, must take your car wherever you say. Be sure the authorization you sign specifies towing only, not repairs or other services. Any other tow truck that appears at the accident scene is acting illegally. Advise the officer on the scene, or report such activity to your local police precinct. Make a note of the tow driver's name, license plate number, and any other identifying information. If your car breaks down, call a licensed tow company of your choice. If time permits, call around to different towing firms to compare prices. An inexpensive or free towing service may be available from an auto club, your insurance company, your car's manufacturer, or your shop of choice. When a parking lot is reserved for customers and you're not exclusively dealing with the proprietor's business, it's unlawful to park there, even for only a few minutes. You can be towed, and you'll have to pay for the tow if you can't produce a receipt from the business from the period when you used its lot. … towed from a shopping center or other private property - Look for a posted sign with the name and number of the company that towed your car. Call the company to retrieve your vehicle. If you can't find a sign, call the local police precinct. … towed from a driveway that you blocked - Call the local police precinct. … towed from the street for a parking or traffic violation - Call the local police precint. If your car is missing and you are not sure why, call the local police precinct where the car was parked.